As I write this, I am on a fast train to Biarritz, where I will spend the night, soaking in the sea and the sun, before heading to Saint Jean Pied de Port to begin the Camino. The train I am riding on can reach speeds of up to two hundred miles an hour, yet it is quiet and smooth, the green French countryside passing by like a silent movie. 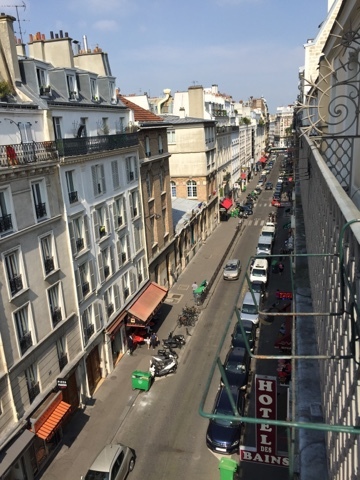 I confess my time in Paris consisted mainly of walking around a plaza by my hotel, eating a marvelous dinner –steak and fries with a hearty Medoc and then collapsing into the bed where I slept long and, finally, well. I am glad I chose to take a couple of days to get over my jet lag and to acclimate myself to the journey. I could have chosen to fly straight to Biarritz for not much more money and have started my Camino a couple of days earlier, but I sensed—even in February, when I made the arrangements for this trip—that I should begin to slow down, to disrupt the speed at which life goes by. From the plane, I really couldn’t see the scenery, merely an ongoing kaleidoscope of clouds, punctuated every now and then by the distant glimmer of city lights, until we hit the long, dark expanse of the ocean. Now, although the scenery is flying by, I am close enough to soak it in, to admire the green pastures dotted with cows, the vineyards with their lush grapes, and the homes with their unique character and architecture. In just two days, I’ll be witnessing even more intimately the countryside I traverse, as I begin my 500 mile trek through northern Spain. I find it fascinating how each method of travel evokes different responses from me. In the plane, I could view the twinkling lights of human development with bemusement or choose to follow my flight on the interactive map on the screen in front of me. This switches from showing approximately where we are on a green map, to detailing how fast we are going and how many more miles to our destination. It also adds altitude and weather information. This map coupled with my own outside view, lulls me into thinking I know exactly where I am and how long it will be until I get to where I’m going. This is the longest and most complex trip I’ve taken to a country whose native tongue I do not know. A friend jokingly reassured me that if I’m 3% fluent in Spanish (the level I was never able to surpass in my Duolingo language app) I am, at least 2% fluent in French. I have found this to be woefully inadequate. Even though navigating the Charles de Gaulle airport was fairly easy, since their directions to baggage, etc. were in English, as well as French, I had trouble accessing the ticketing needed to get a train to my hotel. Clearly my accent on saying “Montparnesse” was not the best, as I was first directed to a ticket counter that wanted to sell me a ticket to a city that sounded similar and was four hours away. I just wanted the Montparnesse train station; if I could make it there, I knew my hotel was only about 300 yards away. Finally, after almost an hour, I was able to purchase the necessary ticket. Further questioning of helpful employees, let me know I would need to transfer from the train to the subway at the Gare Nord station. Exhausted and numb with relief, I sank into my seat, grateful to be on my way. Around me, other passengers spoke in a stream of French that was exhausting to hear. It is counter intuitive to me that it is so difficult to hear conversation in another language, but my unwitting brain strains so earnestly to make sense of it for me that it works twice as hard and for no gain. Of course, I realized, once I got to the Gare Nord station where I needed to transfer, that I had somehow lost my ticket and so then began another long effort of approaching a person, saying “Englais?” hesistantly, and then asking where I could buy another ticket. When I finally reached my destination station, I then pulled up the hotels.comapp with my room confirmation and hotel address and, pointing at it, asked directions from first a host at a restaurant and then a cop, giving parking tickets. I took a very roundabout way but finally got to the Hotel des Bains and found my room whereupon, I collapsed on the bed for a full hour before I could muster the strength to shower and find a restaurant. While I had seen several creperies on the scenic route to my hotel, I decided a steak was in order—it had been about 18 hours since my last proper meal. Before leaving the hotel, I looked up the translation for steak and fries, and red wine (un steak frittes, vin rouge) but the restaurant had its menu in both French and English and the waiter was graciously fluent in both. The meal was delicious and I felt a sense of well-being; I knew where I was, where my hotel was, and how to return at the evening’s end. I was oriented to my surroundings. It had been a stressful day, in many ways. Although I knew where I was when I landed at CDG and knew the address of where I was going, I had no clue how to get there. Since I’m directionally impaired on a good day, this would have been challenging even if I had landed in Atlanta, GA rather than Paris, France. But add to the typical disorientation of a new place, the challenge of not speaking or understanding the native language and not being able to just use my GPS as I have no phone service in Europe and you can imagine how I might have felt a little overwhelmed! This meant I had to both ask for help and trust the advice I was getting. I had no idea where I was in relation to my hotel, I simply knew it was in the same city as I was. True, this can be exhausting and make me feel vulnerable and uncertain, but I saw more in the neighborhood of my hotel exactly because I didn’t know where I was going, and I appreciated its warm, snug room much more fervently than I would have had I simply taken a taxi from door to door, or had been able to use my GPS system to get me there without encountering another person at all. So I did that for my three other seatmates. I silently blessed their lives, blessed their journeys, blessed they way have come and the way they are going. I did notice a different in the air, almost too ephemeral to see, but it was there—a lightness, like that in the sky just after a rain before the rainbow appears. And a reminder that we are all pilgrims, whether or not we seem to know where we are. I was thinking of how different this summer is than last year. Last year, I had just run my first half marathon at this stage and my knees were virtually destroyed, it seemed. My thoughts were consumed with the condition of my knees, with my health, with my desire to complete the pilgrimage before me: that of four half marathons. I did complete that goal, though not in any spectacular fashion; my knee and health issues forced me to not train as much as I’d have liked and, well, let’s face it: I’m not exactly built for the sport! But more importantly, I did something I never thought I could do and I learned a lot about myself, about my limits, my desires, my needs. I saw one of those women at a couple of races and though I inspired her, and she hadn’t been running for as long as I had,, she was faster and always placed before me in our age group. One of the ways I seem to have inspired them is by talking about my method. People often ask first if I am going to camp out under the stars, in some field, or in an alburgue—a hostel which can have anywhere from 8 to a hundred bunks per room. I then confess almost guiltily that I will be staying in a private hotel room with a private bath each night and that, most importantly, the travel company who organized this, also will transport my main suitcase from one hotel to the next; I’ll only have to carry a day pack with my water, snacks, raingear, journal, camera and phone. To be sure, this will still weigh about 5 pounds but it’s nothing compared to carrying everything for the journey on my back and I don’t have to worry about vying for a room at the end of a long day’s walk. As I said, I have been tempted to feel as if I am somehow not a “real” pilgrim, that I’m cheating somehow, but what I’ve seen in the faces of the women with whom I share this is relief and hope. Like me, they couldn’t see how to make the journey having to do everything on their own, but knowing there was a soft bed at night, knowing there are others who will help carry the load, makes the pilgrimage seem attainable. I wonder how many things we don’t attempt because we don’t think we can do them on our own? How many grand adventures we have missed out because we know we don’t have the resources within us ourselves—whether physically, emotionally, financially—to do it? I acknowledge that learning about CaminoWays.org – the company who both reserved all my rooms and will transport my luggage—was the determining factor in undertaking this pilgrimage. I’m turning 54 on this journey, but, really, even in my younger years I was never a hostel, take my chances on a room and then sleep with dozens of other folks, kinda girl. And even beyond the assistance for the actual walk, I have not had to go it alone while preparing for this trek. One friend bought my daypack and surprised me with cash for the journey, another used her significant employee discount to grant me a 30% savings on items bought at the store where she works. Still another bought me some sturdy—and pretty—wool socks. One of my sisters sent me off with a Camino devotional and my whole family made sure to send my birthday cards early. At a Bon Voyage party some friends threw me on my last weekend, one man reached into his wallet and pulled out a €10 note. Still another friend gave me one of those space blankets and yet another new friend gave me a cover for my eyes so I can sleep when I need to! All of these folks, and more—have blessed me, have offered to help carry the load, to ease my burdens and to make it possible for me to take this pilgrimage. This is life at its best, really. When we realize we don’t have to do everything on our own, we don’t have to wait until we are strong enough or rich enough or sure enough before we set out. We just need to be open to the myriad ways the Universe makes visible the vast network of love and support that is always there just waiting for a chance to be of service, just waiting for an opportunity to be a part of the journey. Loved the read. What an amazing journey that will be with you forever. Safe travels my friend. I last saw you at the rally at City Hall. I just went through the article in the Independent and am reading about your journey. I visited Santiago de Campostela in 1970 while a student in Santander, but I didn't have to walk. Have a good journey.